When you have a pressing question, but no one to talk to nor a deck of tarot cards to consult, pick up a pack of playing cards. 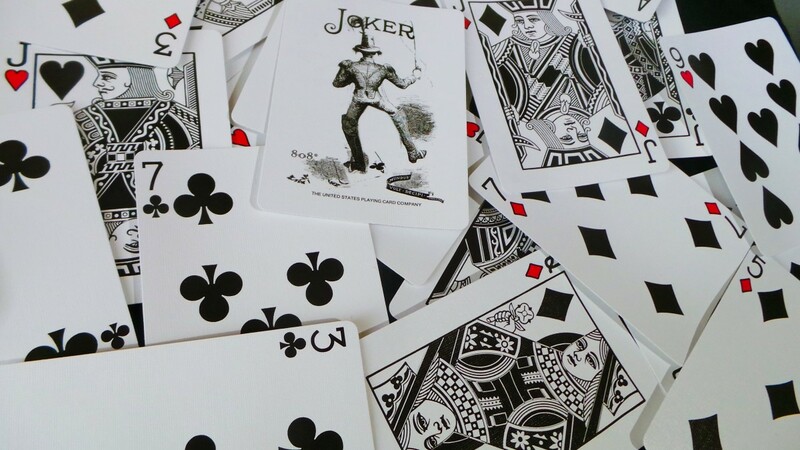 It’s true, you can get information, advice, and insights with plain old playing cards. 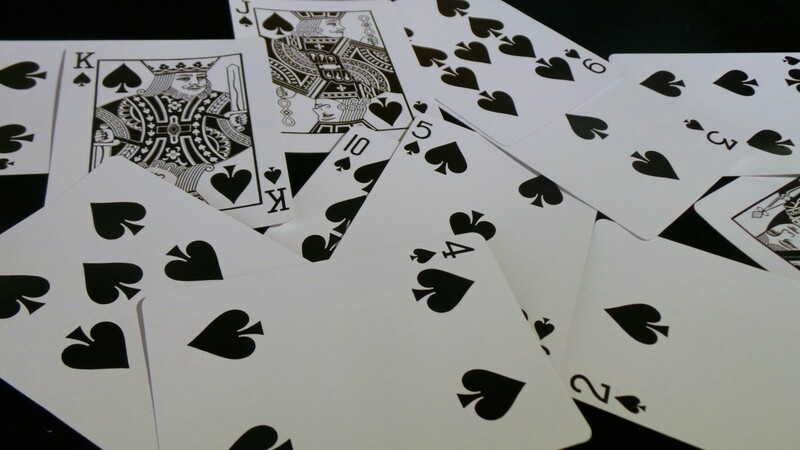 In this article, we’re taking a look at reading playing cards for love. When using the method described here, it's important that you stick to one-card readings. If you begin to combine cards, you will become confused. 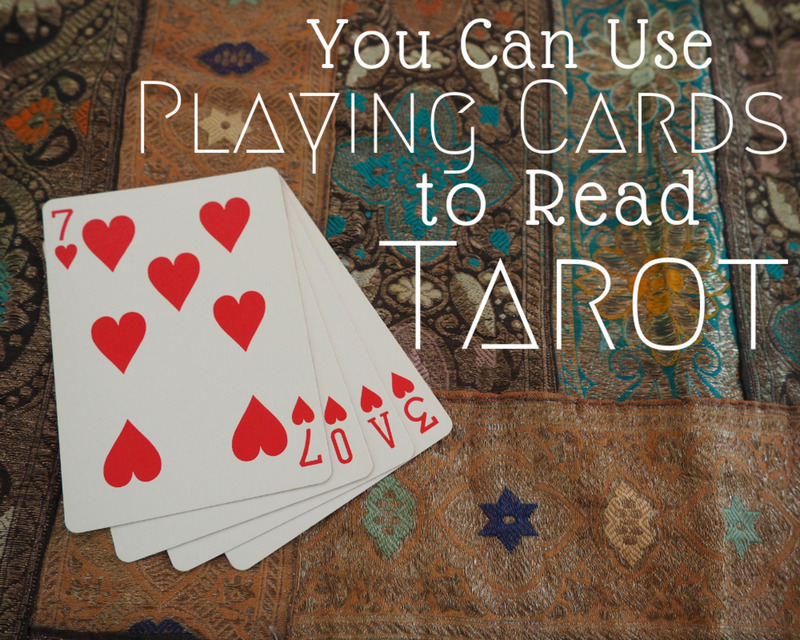 If you want to learn how to read with more cards, check out How to Read Tarot with Playing Cards. You'll need to learn the basic structure and how cards interact together. 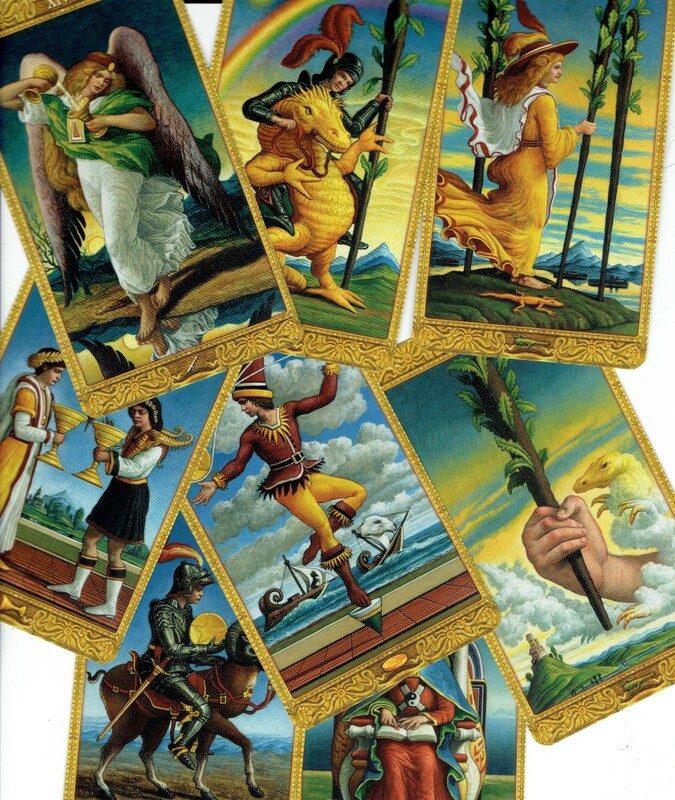 And, if you are determined to take it further, I also have a selection of playing card tarot spreads. For now, here is a basic fast-answer system to your most pressing romantic questions. The art of reading cards is called 'cartomancy'; literally, telling the future with cards. Clubs = Wands: action and creativity - ideas, inspiration, and passion that cause us to act. Hearts = Cups: emotions, love - all the feeling aspects of life. Spades = Swords: intellect and communication - all that which goes on in our heads. Diamonds = Pentacles: material concerns - wealth, health, career. Think about the question you want to ask. My advice is to avoid questions that will give you no useful information whatsoever. Questions like, “Will I meet my romantic partner this year?” What’s the point? Instead, ask “What do I need to do to meet my romantic partner this year?” That gives you a piece of information that you can actually use to take positive action. It puts you in control instead of you thinking you are at the mercy and whim of fate. So when formulating your question, try to avoid what we call a closed question. That means one that can be answered yes or no. You want to elicit as much information from your card as possible. What do I need to know about this relationship? How will I know my love when I meet him/her? What should I do to be ready for romance? What can the cards tell me about this person? What is the love energy surrounding me at the moment? What positive action can I take to find love? How can I make him/her notice me? I think I’m in love, can the cards confirm my feelings? I think he loves me, can the cards confirm my thoughts? I’m sure you can think of a better one that applies to your situation. In the next section I’m going to list out the general meanings of the card as they apply to love. It’s up to you to interpret them to fit your question. Ace of Clubs: new inspiration, passion, intense love affair. Two of Clubs: delaying of plans, waiting for love, obstacles. Three of Clubs: you’ve done all you can for the time being. Patience. Four of Clubs: fruition, stability, consolidation (engagement, marriage, living together). Five of Clubs: competition, challenge, someone else fighting for attention. Six of Clubs: victory, you reach your goal and/or attain your desire. Seven of Clubs: standing up for your rights, going against the consensus. Eight of Clubs: things moving quickly, hurried marriage, pregnancy. Nine of Clubs: possible end of a relationship, rocky patch, inner strength required. Ten of Clubs: habit, boredom, determination to keep going. Jack of Clubs: unfaithful, immature man. Has many affairs. Queen of Clubs: passionate, possibly unfaithful woman, fun friend. King of Clubs: strong alpha male. Leader. Ace of Hearts: new, overflowing of love, deep attraction, initial feelings. Two of Hearts: mutual attraction, love blossoming, connection at a soul level. Three of Hearts: fun, friendship, celebration, lightheartedness. Four of Hearts: turning inward, mild depression, missing love opportunities. Five of Hearts: emotional challenge, difficulties, loss, despair, break-ups. Six of Hearts: reunions, reconnection, reconciliation. Seven of Hearts: choices, indecisiveness, inaction. Eight of Hearts: solitude, walking your own path, leaving a relationship. Nine of Hearts: independence, self-sufficiency, love of self, happy right where you are. Ten of Hearts: family, emotional fulfillment, long-term love. Jack of Hearts: romantic, immature young male, serial relationships. Queen of Hearts: romantic female, good friend, emotional support. King of Hearts: gentle male, supportive, someone to trust. Ace of Spades: new idea, sudden realization/understanding, clarity, truth. Two of Spades: unwilling to face the truth, unable to reach out. Three of Spades: miscommunication, misunderstanding, relationship problem. Four of Spades: rest, recuperation, solitude, reassessment. Five of Spades: betrayal, lies, misled, duped. Giving up, walking away. Six of Spades: moving on, recovery, travel, hope. Seven of Spades: acting alone, taking back control, regaining confidence. 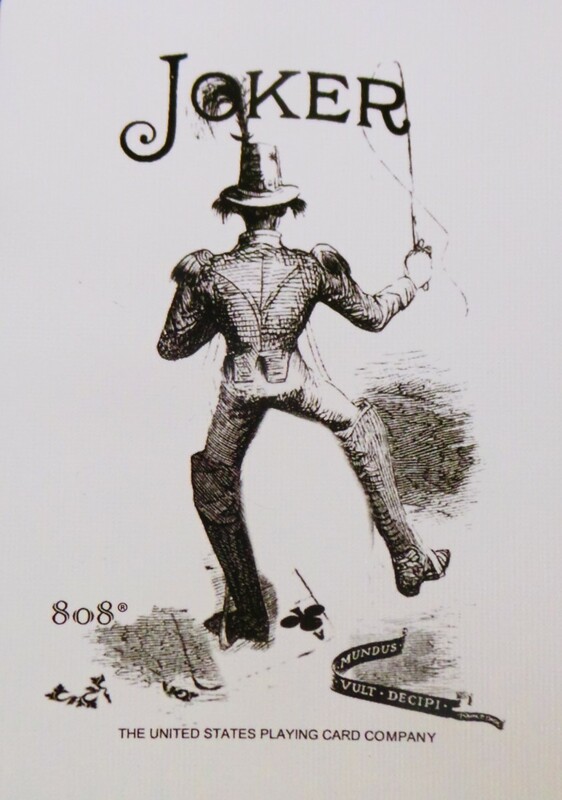 Eight of Spades: thinking you’re trapped, unable to progress, self-deception. Nine of Spades: nightmares, overwhelmed, problems. Ten of Spades: ending, divorce, trauma, new beginning. Jack of Spades: intellectual, focussed, clever youth. 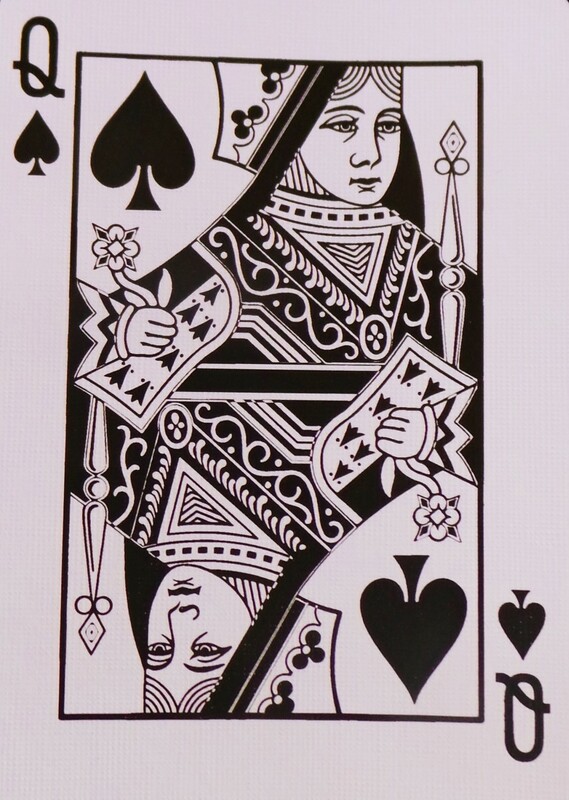 Queen of Spades: highly intelligent, influential female. Sometimes indicates ‘the other woman’. King of Spades: professional, intelligent, mature man. Usually highly qualified and authoritative. Ace of Diamonds: relationship enters new phase. New home, project or other practical matter. Two of Diamonds: adjustment, balance, getting used to each other. Three of Diamonds: focus on work, creating and building relationship. Four of Diamonds: unwilling to compromise, repression, meanness. Five of Diamonds: financial loss, difficult times, housing issues. Six of Diamonds: charity, helping hand, someone willing to listen. Seven of Diamonds: vaguely dissatisfied, wanting more, looking for practical opportunities. Eight of Diamonds: change of direction, prioritizing career or studies over love. Nine of Diamonds: independence, self-sufficiency, satisfaction. Ten of Diamonds: family, inheritance, business, organization, financial security. Jack of Diamonds: hard-working, sincere young man. Queen of Diamonds: practical, mother figure, sensuous woman. King of Diamonds: mature, self-made man. Enjoys luxury and fruits of his labor. It’s your choice whether or not to include one of the Joker cards or not. 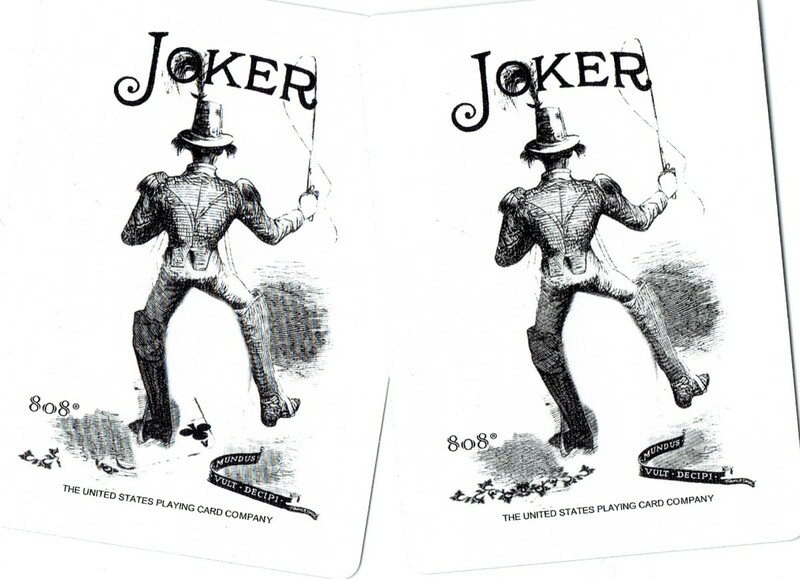 Generally the Joker is equivalent to the Fool in the tarot. It can represent the person asking the question, or if it shows up in a random drawing, it means taking a chance, embarking on an adventure, or not worrying about the consequences of one’s actions. Question: Andy asks, “What do I need to know about this relationship?” He’s recently met someone and is attracted to her but not sure whether to take it any farther. Randomly drawn card: Queen of Spades. Andy doesn’t feel that this card represents his new girlfriend. It’s possible that there could be some sort of interference or influence from an older woman. Perhaps his mother, or hers. He decides to take things cautiously and to pay attention to signs that someone might be attempting to sabotage their relationship, or come between them. Armed with this knowledge, he’ll be able to deal with it when, and if, there’s a problem. He plans on drawing another card after a week or so has passed. If you have another question, then simply shuffle the deck and do a reading straight away. However, beware asking about the same situation too often. You’ll not get a straight answer, and you’ll end up feeling confused. Set the cards aside, wait a few days, then try again. Feel free to ask any playing card love questions in the comment section, but note that I cannot give free readings here. What can the playing cards tell me about a certain person in terms of feelings? I'd suggest formulating your question, such as, how do they feel about me? And, how do I feel about them? Then draw one card to represent each person. Once you have your answer, shuffle again and draw a single card to represent the future of the relationship. I asked the cards if I'll be happy with the man who's currently courting me and got a king of spades, queen of hearts and 4 of clubs. What does it mean? What do you think it means? Also, you only need one card to answer a yes/no question. Otherwise, it becomes confusing. It looks like marriage or living together to me. How do I properly lay out playing cards for love readings? There is no one way to lay out the cards. 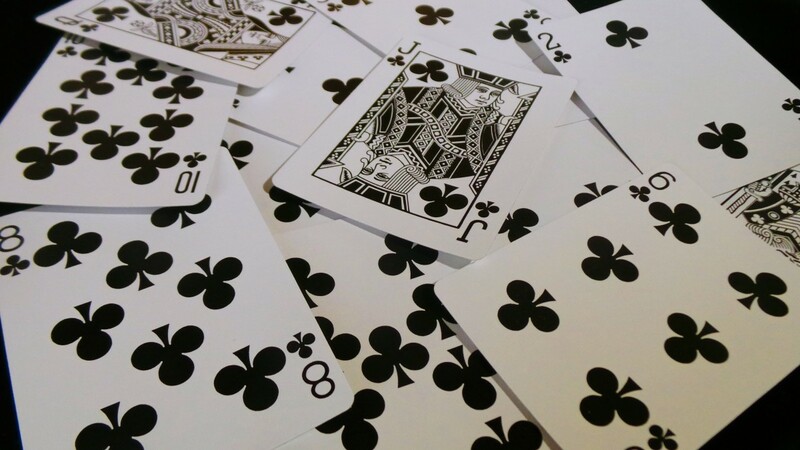 If you are doing one-card readings, just shuffle and draw a random card. For two or more, I tend to shuffle, cut the cards with my left hand, place the bottom section on the top and turn the cards from the (new) top of the deck. How can I get a love timeline by reading playing cards? Before you lay out your cards, express your intention for them to reflect a time-line. Then designate three positions: near future, medium outlook, distant future. Focus on the situation, shuffle and turn your cards. I think he loves me. Can playing cards confirm my thoughts? They can certainly give you an indication of how things are going between you. Give it a try. I suggest using a single card to avoid any confusion. You might not receive a definite answer but then again you might. 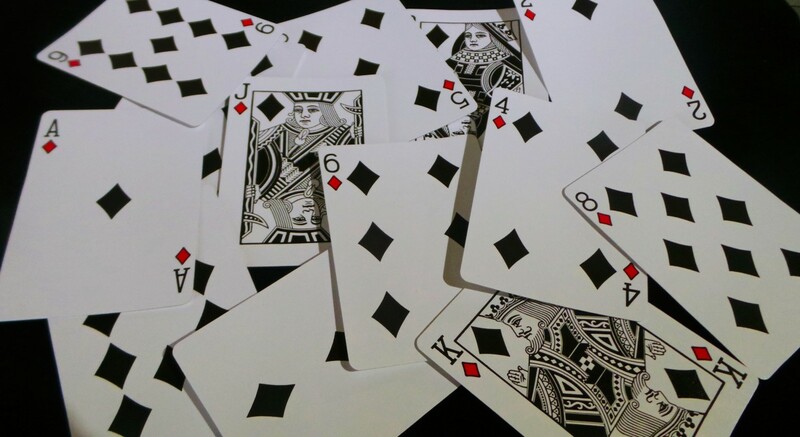 Cards that would confirm his love would be Ace, Two, Six, Ten and King of Hearts, Ace and Four of Clubs. You need to read the lists of meanings in the article to get the full picture. 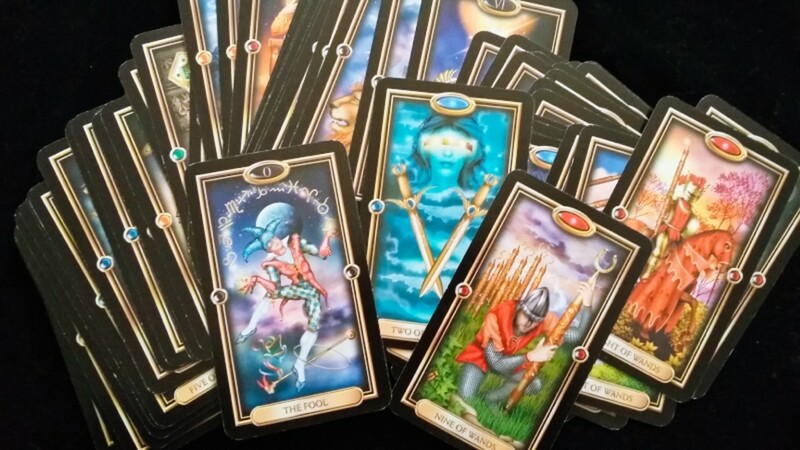 How do I spread out my playing cards for an accurate love tarot reading? 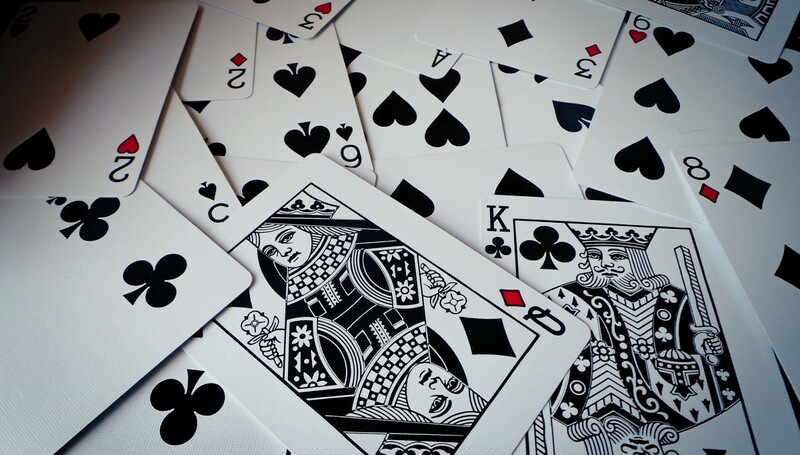 What can playing cards tell me about a certain person in terms of love? You could devise a personal spread designed around what aspects of the person that you want to understand. So, for instance, pull out the 12 Courts and decide which one might represent them. Then work out three questions. Might be: 1. What motivates them? 2. What stands in their way? What do they love? Or: What do I need to know about this person? 2. How do they see me? 3. Are we going to have a relationship? Make up a spread that works for you. Good luck. 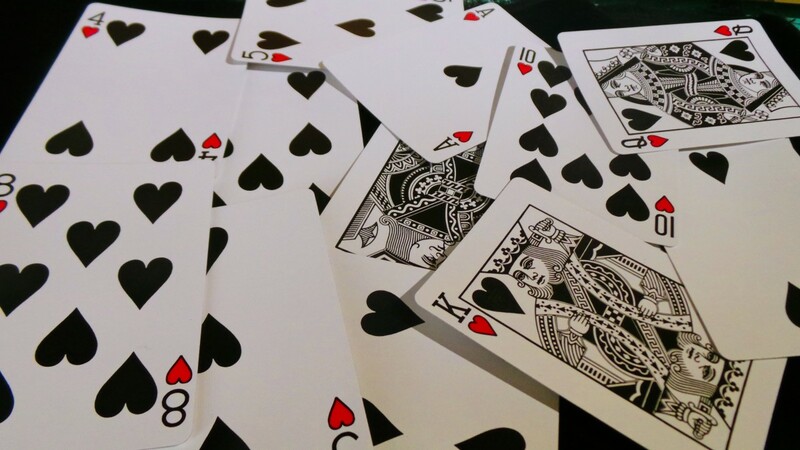 Can the cards tell me if my love will be reciprocated? Give it a go. Shuffle your deck and draw a card. There's your answer. Would I be able to write on the cards to remember what each of them stand for? Yes, of course. However, bear in mind that adding keywords in that way can sometimes inhibit your intuition. If you are learning it's fine, but try to learn the number/suit correspondences if you can. Otherwise, you won't even register the card itself, just the words you've written on them. You might as well write them on a blank card. How many cards for each question? From the second paragraph, "When using the method described here, it's important that you stick to one-card readings." I asked my tarot deck if he really loves me and it came Ace of Hearts, King of Hearts and Ace of Spades, and then Ace of Diamonds. When I asked if I should approach him or not it came Two of Clubs and Two of Hearts. Could it be good sign or not? You need to understand that if you want a yes or no answer from the cards, you can only draw one card. Otherwise, as demonstrated here, you will be completely at sea. 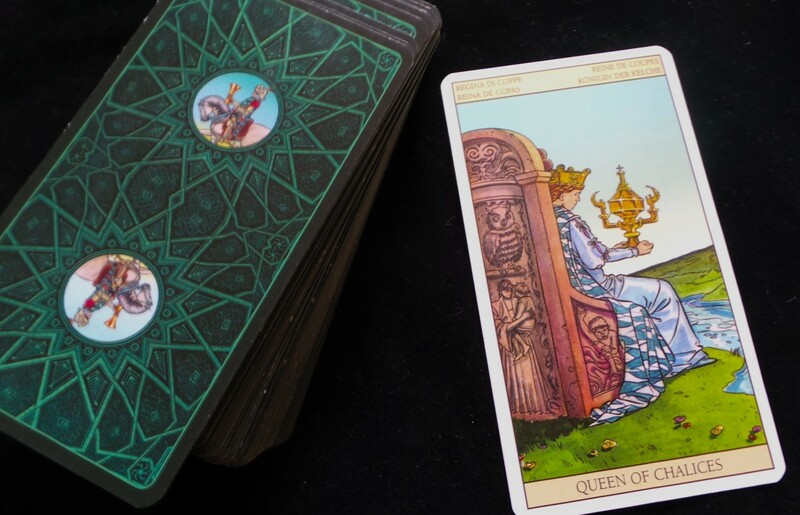 Right at the beginning of the article, this is what it says, "When using the method described here, it's important that you stick to one-card readings. If you begin to combine cards, you will become confused." Another thing is, if you've not spent time together, there's no way either of you can love the other. You might be very attracted to each other, but you can't possibly experience love in that way. That only happens in romantic songs. I suggest you go back to your cards. Think about what it is you want to know and then stick to one card per question. This page will help: https://exemplore.com/fortune-divination/Playing-C... but let your intuition expand on the answer. 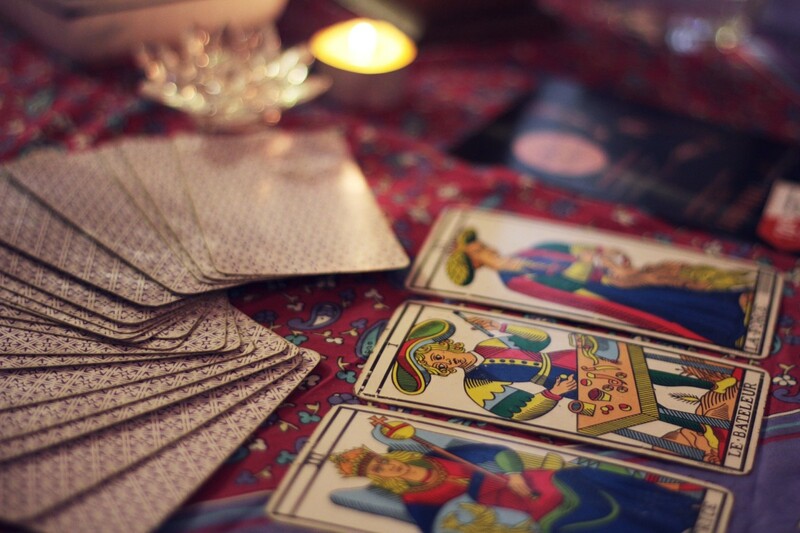 Can tarot cards help me to know my love when I meet him? You just have to try it. When you meet someone interesting, draw a card and refer back to the meanings on this page. Will I meet my desired partner this year? I'm afraid I can't give free readings here, I simply don't have the time to spare. However, I encourage you to get your own deck of playing cards and try to read them yourself. Can playing cards tell me if a certain person likes me? They can. Grab your deck of cards and draw a card. Good cards are the Ace and two of hearts, ten of hearts, Ace of Diamonds. The Ace of Clubs points to the possibility of a passionate affair. Whatever card you get, check back with the lists provided in the article. Can the cards tell me when I will meet my true love? Personally, I find trying to read timings with playing cards and with tarot cards very difficult. I think you have to develop your own system along the lines of Diamonds taking months, Cups taking weeks, Clubs a couple of weeks and Spades a few days. I think he likes me. Can reading playing cards confirm my thoughts? No doubt they can. Give it a try. The techniques for reading playing cards for love are given in the article. Draw your card, then check the lists above for your answer. However, those answers are very short, of course, so if you take the meaning I've given, you can expand it. So let's say you get an awkward card like the Four of Spades (rest, recuperation, solitude, reassessment). It doesn't seem to fit, but if you consider your situation, the card might be advising you to relax, let it go, don't push it. It also might be pointing at other areas of your life. Maybe you have been getting stressed out over work or family issues? The cards always give you what you need to know. Just grab your cards and give it a go. You'll soon be reading like a professional. Kim, for this kind of question you only need one card because you are looking for a yes or no answer. If you go with the first card, then the answer is probably no. See the meaning given above. Clover Le, What do you think the cards mean in connection with your own circumstances? My self-reading question was "What do I need to know about my love life?" and 2 Kings of Diamond and Spade appeared so what does it mean exactly? I would be suspicious, to be honest, but I wouldn't jump to conclusions on the turn of a few cards. Six of Swords/Spades, indicates someone moving/drifting away. The two Clubs/Wands are problematical -- the Knight of Wands is a philanderer, the Queen of Wands is flighty. As I said, hold back and see what unfolds, Lindsay. I asked "What do I need to know about my current relationship (3 years, I have concerns of infidelity) and I drew a 6 of spades. For clarification I drew two additional cards (Jack of Clubs and the Queen of Clubs). What are your thoughts? Yes, I agree, Louise, tarot (or whatever) is just brilliant at shining a light for people. Thanks for this hub. I used to read cards from a deck when I was younger and my readings were accurate. I have never heard of anyone else doing it until I saw this hub. I also used to read tarot but now I only read enlightenment cards for which I get a lot of requests. I like that I can be of help to those that are not even sure of how they are feeling. After reading your hub I might even pick up a deck and see how I go on. I have never heard of reading playing cards, but I'm going to start doing it. My husband will think it's crazy but he already thinks I'm crazy, so I may as well expand my "craziness" to something fun. Nice work! Hi Broun, it's just a question of what feels more comfortable for you. For me, it's definitely tarot. Playing cards are more temporary. Others read playing cards all their life.